Kids love nothing more than chucking nice smooth stones across the surface of a gleaming lake. As a kid, watching flat, polished skippers skimming right the way across was pure delight… especially if I could fluke (or master) a jump over a low-lying dead tree branch at the same time. Fast forward some 30 to 40 years and now I’ve got the chance to teach the same skills to my kids, with one major advantage… we live in an area that abounds in skippers’ right at the water’s edge of Lake Cathie. Originally named ‘Cati Creek’, the area was changed to Lake Cathie as required by the Postmaster General to avoid confusion with other ‘Cattais’ in New South Wales, but the name is still pronounced ‘cat-eye’. Lake Cathie is by no means famous for its night life, entertainment or shopping facilities. It’s a rather laid back, quiet place that will never attract the wild life set… thank goodness! Rather, it’s an ideal family holiday destination that’ll see plenty of quiet relaxed days by the lakes edge, BBQ’s, bush walks, fishing, boating and general family orientated day excursions. Heck, there’s not even a lot in the way of restaurants or eateries to choose from, although there is a coffee shop and tops bakery in the shopping village centre; so if you're up for a hearty meat pie, chicken sausage roll (just to be different) or fresh bread, I'd thoroughly recommend the happy crew there. There’s also a supermarket, bottle shop, chemist, Post Office, Tavern and a few other smaller shop fronts to keep the pantry well stocked. Just across from the lake itself is another small set of shops with takeaway and tops pizza joint from which we partake all too often. At just over twelve clicks south of Port Macquarie (NSW) and a (long) stones throw north of the more well-known smaller towns of Bonny Hills and Laurieton, Lake Cathie has become our home town to bring up our four kids and to escape the rat-race, smog and hustle ‘n’ bustle of our previous existence in stinky Sydney (as the kids call it). Yeah we know, the kids’ll want to hit the clubs and night life later in life, but we figured this would be an ideal place to cultivate and grow them into fine human beings… and a top spot for tossing rocks into the lake. The first job was to teach the eldest the difference between a ‘skipper’ and a ‘plonker’… to which he hasn't quite got the knack yet, but hey, he’s only five years old! So, if you’ve got a tinnie, kayak or canoe, like to fish from the waters edge or from said watercraft, or are content sitting back watching the rippling waters edge, or heaven forbid raise the effort to turn around and do all of the above in the ocean, then you’ve come to the right place for your holiday. Now, that’s one of the great attractions of Lake Cathie, the lake fronts the ocean and offers another world of water based activities. For those of a more… umm… mature outlook (some call them oldies)… there’s always the local lawn bowls and recreation club which boasts the worlds largest bowling ball plonked out the front of the club grounds. Although I can’t vouch for its relaxation therapies as I’ve never tried the sport, I have sampled the Bowlo’s menu and bar and give it the big thumbs up. Perhaps someday I’ll wonder in and try the game; but one must assume it’s a totally different arm action to hurling skippers though! While Lake Cathie is at times tidal, the lakes entrance does naturally block via a sandbar at the coastline, which is manually dug open at times. When closed, the lakes water is tannin coloured from the surrounding Melaleuca (tea trees) trees, although when opened it’s at its prettiest and exhibits a deep green/blue hue that makes it even more appealing. When ‘open’, the lake flourishes with fish and therefor the fisherman morning noon and night to which I’ve bore witness to plenty of dinner plate-sized flathead, whiting, Jewies being skull-dragged to shore, all to the delight of the kids wanting to “slap ‘em on the BBQ Dad”. A tip for the holidaying nighttime fishos… have a go from the bridge on the main drag; they land ‘em from here regularly, but don’t tell the locals I told you! For swimming, the lake at the edge of the grassy picnic area with adjoining kids’ playground on Ocean Drive is ideal for kids and adults alike. The knee-deep water and slight tidal pull offers hours of playtime for parents to tug the kids around on their body boards; although floating and drifting without the effort of tugging is far more relaxing from the parents’ point of view. For the more adventurous, hitting the surf is an easy stroll across the lake, but do take care of the rips. The local beach is only patrolled during the Christmas holiday period. Either way, you’ll have a ball during the warmer summer swimming months. Taking an easy stroll into the northern headland will find you weaving through the bush to emerge at one of the alternate beach entry points or the lookout that provides a vista over the whole of the main (eastern portion) of Lake Cathie to your right and the open ocean to your left, plus a stand of magnificent large pines along the lakes edge. Back over the western side of the bridge, there is a boat ramp and the western section of Lake Cathie, to which it runs north to Lake Innes. It’s this part that, when open to the tides, becomes quite shallow and exposes masses of sand flats at low tide, while high tides allow more motor-boating action. While it may not look overly exotic, it does provide ample opportunities for pumping yabbies’ for bait, plus canoeing further north where you’ll spot a Sea Eagles nest. If you’re lucky, you’ll spot the huge white bird patrolling for fish. As an added bonus there is also another Sea Eagle that patrols the coast line near Middle Rock and catches the uplifting air currents up and down the coast. It’s here that you’ll also often find kite boarders performing amazingly high leaps from the crests of waves. With regard accommodation, it seems to me while cruising the local streets that every second joint is a B&B, motel, short stay, long stay, kids welcome, pets allowed, van park and most other types of accommodation… except high rises of course, so you shouldn’t have too much problem finding something to suit, but do book ahead to avoid the disappointment! Be sure to bring a camera with a decent long lens if you’re into photographing animals; you’ll get plenty of opportunities. It wouldn’t take long to get a decent list of animals that you’ve spotted in and around the Lake Cathie area. A few we’ve spotted on numerous occasions are: kangaroos, koalas, deer, fox, Sea Eagle, Kookaburra, Black Cockatoo, Galah, Pelican, Flathead, Whiting, Bream, Alpacas (in a paddock), camels (on the way to Port Macquarie)… and it goes on. 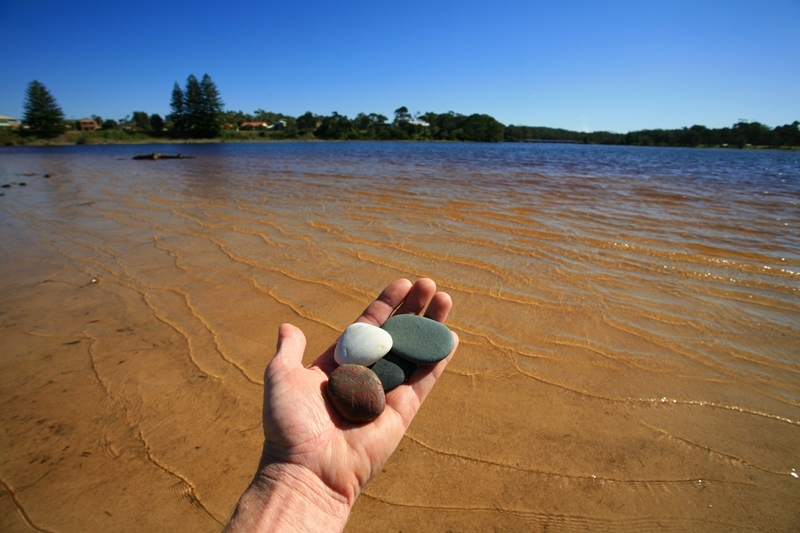 Paradise for a fisho’ is having the option of casting into the beach or a lake - Lake Cathie offers just that; magnificent, clean beaches over one shoulder and the ever-changing lake over the other. There’s plenty of fresh bait on offer too - pippies and sand worms in the beach sand or pumping yabbies’ in the lake. Then if catching them isn’t enough, there are council BBQ’s in the park at the lakes edge for cooking on the spot – it really doesn’t get any better than that! If you’re a little luckless at landing a fresh feed, an about-turn will see the local shops where you can buy your tucker and cold drinks. We’re lucky to have little kids that love bush walking. A quick roadside change from school clothes into walking clobber is a regular ritual after school knocks off. It’s the kids’ choice – beach walk, bush walk, lakeside walk or a combination of all three – an hours fun is generally enough to wear them out for a great night’s sleep, plus they get to spot plenty of wild life, get the sand and salt water between their tinny toes, and, as a bonus they’re getting great at skipping stones on the lake… but a long way to beating my record of 25 skips – Dad rules at skipping stones! If you’re heading from the south, Lake Cathie can be easily accessed from the Pacific Highway via the westerly Houston Mitchell Drive, then onto Ocean Drive. From the north; either the same route or from Port Macquarie, then along Ocean Drive. Lake Cathie is roughly 4 hours north of the big smoke of Sydney. The warmer months are definitely the ideal times for Lake Cathie as swimming is a major attraction; however fisho’s and nature lovers will still love the experience all year round. 4x4 drivers can access the beach with the relevant permits. Lake Cathie has its own small village centre; food, fuel, drinks, bait, fishing permits and takeaways are all at your doorstep. For fine dining though, a short drive north to Port Macquarie or south to Bonny Hills and Laurieton is the go. There is a plethora of B&B’s, motels, short stays, long stays, kids welcome, pets allowed, van park and most other types of accommodation in and around Lake Cathie. Visit www.portmacquarieinfo.com.au for all attractions and accommodation in and around the area.